I admit, I am not exactly a pro on the kitchen and most times, I do not even enjoy cooking. However, after being married for over 10 years and having two little boys, I have to cook and sometimes I have to get very creative to get all of the testosterone in my house to eat properly. This means cutting fruits and vegetables into small pieces and hiding them in other more palatable foods. When doing this, having a good knife and peeler is a must, and I definitely have that with NanoRazor 3" Ceramic Paring knife with free peeler. While this knife is very affordable, it is highly effective and sharp too! It slices vegetables very finely for me to hide in other dishes, and that is the most important feature to me. This knife is very shapes and easily cuts through most fruits and meats like butter, and definitely functions for exactly what I intended to use it for. It even cuts tomatoes into paper thin slices, which is a tough task! The knife also came beautifully packaged in a magnetic closed box. 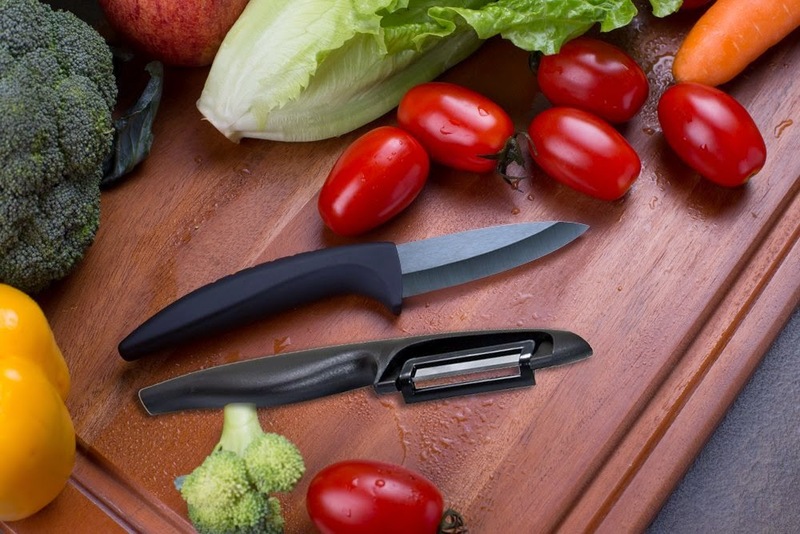 The packaging, along with the sleek black color and design on the knife, gives this paring knife a definitely feeling of being much more expensive then it really is! I think it makes a wonderful Christmas present for anyone who loves spending time in the kitchen, or it would even make a fantastic dirty santa gift. I bet everyone would be fighting over it! I think next year I may just consider it!